This is the PopLifeArt.com blog. I'll use the blog to let you know what's going on in the world of celebrity art. Legendary rocker Paul Stanley of KISS has scheduled more gallery shows of his artwork. On June 15, 2007, He will hold an exhibition at Celebrites Gallery in Wailea, Hawaii. 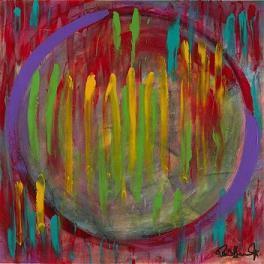 Paul will unveil some of his new Original and Mix media paintings. Contact the gallery for more information. In July Paul Stanley will exhibit his artwork at Wentworth Gallery in Orlando. He will make appearances on Friday July 6 and Saturday July 7. Call the gallery for details on the special VIP Reception with Paul - 407-903-9055 or 800-732-6140. The image posted here is "Tokyo Rain" by Paul Stanley. Paul sold this original painting at his recent art gallery show in Charlotte, North Carolina. See the Pop Life Art homepage for links to the artwork of Paul Stanley and other musicians, singers, and actors. The Pop Life Art Blog has moved. Visit the new location for the latest entries. Ringo Starr Art Book: "Painting is My Madness"
Photo By Sammy Davis, Jr.